Jersey City History - Old Bergen - Chapter XXXIII. IN 1789 the ferry landing at Paulus Hook was improved by the placing of steps, down which the passengers climbed, while horses and wagons were urged or lifted aboard the boats that served as means of transportation. 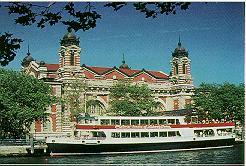 This ferry connected with the stage route for Philadelphia, the proprietors of which built a tavern near Grand Street ; and as the boats ran only between sunrise and sunset, the passengers were obliged to cross the river the night before, and consequently enrich the whilom host with the cost of the night's lodging and entertainment. The wagons to be kept in good order, with good horses and sober drivers. They purpose to set off from Philadelphia and Paulus Hook on Mondays and Thursdays punctually at sunrise, and be at Princetown the same nights, and change Passengers and return to New York and Philadelphia the follow ing days. The Passengers are desired to cross Paulus Hook ferry the evening before, as the wagon is not to stay after sunrise. Price, each Passenger from Paulus Hook to Princetown, 10s. ; from thence to Philadelphia, 10s. ; also ferriage free. Three pence each mile any distance between. Any gentlemen or ladies wanting to go to Philadelphia can go in the stage and be at home in five days, and be two nights and one day in Philadelphia to do business or see the market days. In 1790 the Newark turnpike road was laid out, and over this after that date the Philadelphia stages wended their way. A considerable portion of the road from Jersey City to Newark was bordered on both sides by a thick-growing cedar swamp, which, being full of convenient hiding places, became the resort of thieves and robbers. Their depredations became so frequent, and the chance of apprehending them was so small, that in order to deprive them of this place of refuge, the whole tract was designedly burned. There is a causeway to Belleville built wholly of wood with much labor and perseverance, in the midst of water and soil, that trembles under your feet. It proves to what point may be carried the patience of man, who is determined to conquer nature. All the way to Newark (nine miles) is a very flat, marshy country intersected with rivers; there are many cedar swamps abounding with mosquitoes, which bit our hands and legs exceedingly; when they fix, they will continue sucking our blood if not disturbed, till they swell four times their ordinary size, when they absolutely fall off and burst with their fulness. . . .	At two miles we cross a large cedar swamp; at three we intersect the road leading to Bergen, a Dutch town one-half mile distant on our right; at five we cross the Hackensack. The mosquito is evidently, from the contents of this letter, not a product of our present civilization, but existed even in those conservative days, and conducted his business with the same active aggressiveness as in more modern times. It (this road, author's note) is very convenient for those who live at Newark, and carry on their business at New York. Taking an early start on the 4th of June, I crossed Hudson's River to Paulus Hook to take the stage Industry for Philadelphia, an hour and a half being required to make the passage; crossing the Hackensack, where a bridge was going to be built, to prevent the tedious passage by boat or scow, and the Passaic also, the coach and all in the scow, by means of pulling a rope which was fastened to the opposite side, we came to Newark. At this date, one stage sufficed for the transportation of residents of Newark who did business in New York, leaving Newark at six o'clock a.m., and returning from New York at three p.m. In 1800 and for a number of years following, the only public conveyance of passengers by land between Newark and New York was by means of one two-horse stage coach, which went to Paulus Hook in the morning and returned in the evening. The road was extremely rough, and in wet weather almost impassable. In 1813 there were four stage lines between New York and Philadelphia: The Pilot, leaving New York at 5 a.m., accommodating seven passengers, and arriving at Philadelphia next morning; Commercial, leaving at 7 a.m., passengers remaining at Trenton over night and reaching Philadelphia next morning; Mail, leaving at 1 p.m. and arriving at Philadelphia next morning at 6 o'clock; Expedition, leaving New York at 4 p.m., stopping at Rahway, then at Burlington for the night, and arriving at Philadelphia the next afternoon. Through the courtesy of Dr. L. J. Gordon, we are enabled to present an accurate cut of an interesting incident connected with early railroading, which, although not especially related to the general subject of this work, still clearly shows the small beginnings of our present magnificent transportation system. Much opposition to the proposed method of propulsion by steam was developed, and theories were demonstrated to show the impossibility of success. One objection advanced was that it was not possible for a locomotive to round short curves. In order to prove the fallacy of this claim, Peter Cooper built a locomotive, which he called Tom Thumb, for practical experiment. It was tested on the Baltimore and Ohio Railroad Aug. 22, 1830. An extract from a letter written by H. B. Latrobe, brother of the chief engineer of this road, gives a graphic description of the event. I send you copy of my sketch of Mr. Cooper's locomotive and the horse-car. . . . The trip was most interesting. The curves were passed without difficulty at a speed of 15 miles an hour. . . . But the triumph of this Tom Thumb engine was not without a drawback. The great stage proprietors of the day were Stockton & Stokes, and on that occasion a gallant horse of great beauty and power was driven by them from town attached to another car on the second track-for the Company had laid two tracks to the mills-and met the engine on its way back. From this point it was determined to have a race home. The start being even, away went horse and engine, the snort of the one and the puff of the other keeping time and time. At first the horse had the best of it, for his steam would be applied to the greatest advantage on the instant, while the engine had to wait until the rotation of the wheels set the blower to work. The horse was perhaps a quarter of a mile ahead, when the safety-valve of the engine lifted and the thin blue vapor issuing from it showed an excess of steam. The blower whistled, the steam blew off in vapory clouds, the pace increased, the passengers shouted, the engine gained on the horse. Soon it lapped him ; the silk was plied, the race was neck and neck, nose and nose. Then the engine passed the horse, and a great hurrah hailed the victory. But it was not repeated, for just at this time, when the gray's master was about giving up, the band which drove the pulley which moved the blower, slipped from the driver, the safety-valve ceased to scream, and the engine for want of breath began to wheeze and pant. In vain Mr. Cooper, who was his own engineer and fireman, lacerated his hands in attempting to replace the band upon the wheel; in vain he tried to urge the fire with light-wood. The horse gained on the machine and passed it; and although the band was presently replaced, and steam again did its best, the horse was too far ahead to be overtaken, and came in the winner of the race. The experience of the passengers on the early steam roads is told in a letter of Judge Gillis of Ridgway, Penn., describing his trip from Albany to Schenectady in 1831. The trucks were coupled together with chains or chain links, leaving from two to three feet slack; and when the locomotive started, it took up the slack by jerks with sufficient force to jerk the passengers, who sat on seats across the top of the coaches, out from under their hats, and in stopping they came together with such force as to send them flying from their seats. They used dry pitch-pine for fuel, and there being no smoke or spark catcher to the smoke-stack, a volume of black smoke, strongly impregnated with sparks, coals and cinders, carne pouring back the whole length of the train. Each of the tossed passengers who had an umbrella raised it as a protection against the smoke and fire. They were found to be but a momentary protection, for I think in the first mile the last one went overboard, all having their covers burnt off from the frames; when a general melee took place among the deck passengers, each whipping his neighbor to put out the fire. Hudson County, New Jersey is a place of many firsts - including genocide and slavery. Political corruption is a tradition here.